Before we went away you might remember I posted that we had thought we might try and get Jiggy into school for at least part of the week. I really felt the need to understand his behaviour better and could not replicate the group social and academic conditions at home in order to see how he would behave if we put him back into mainstream. Also, to be honest, we had really hit a wall. He can be incredibly uncooperative and to be successful I am sure that home education requires an element of team work, at least now and again! I also felt that as he was getting older he would need our relationship to be simpler. 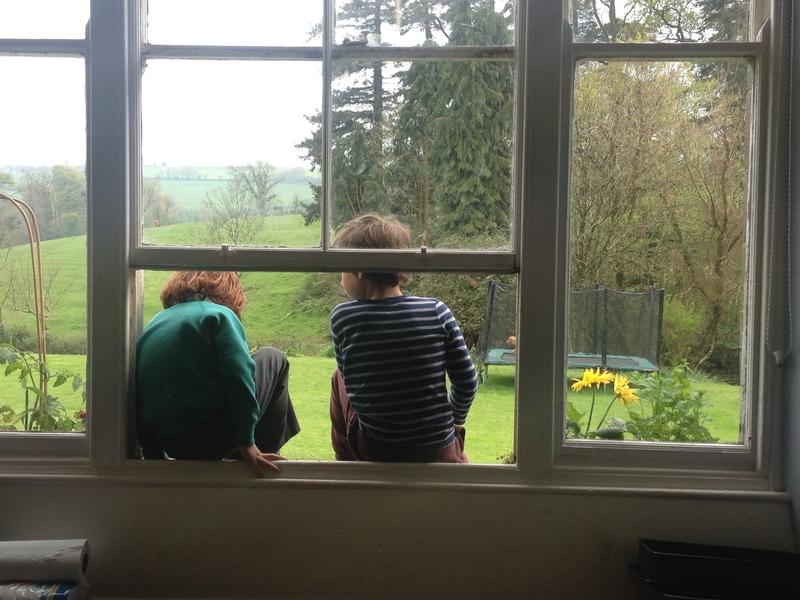 Being Mum to teenagers is about as much as either party can take I think – adding teacher in to the mix was, I felt, going to be really challenging. In the meantime and in order to grease the creaky wheels of any possible transition to secondary school next year we are pushing on along the ridiculously long and winding road to proper FASD support from the only specialist clinic in the country and today, 14 months into the process, we have been to clinical genetics in order to rule out any other reason for his particular and thankfully rather unusual blend of behavioural quirks. I was expecting a bit of an in and out session (and all sorts of drama around blood testing) but was wrong on both counts. The consultant actually knew about FAS, properly, and it only took two adults to get enough blood. Jig doesn’t look particularly FAS although his behaviour is a perfect match and that is pretty much what they confirmed today – most likely diagnosis ARND either with or leading to ADHD. No surprises. However, what has made me falter slightly is the fact that as we came in (as a group, this is school holidays after all) the consultant mistook Titch for the FAS child he was expecting to see… We know – because like most parents in our position we are well read on this subject – that Titch has more of the FAS features than his big brother and he does have learning difficulties but his behaviour is just fine and so I guess we had let the reality of it fade somewhat. Does it matter that he is so obviously FAS? Should we maybe do more, do something else, change things somehow now that we have two FAS boys and not just one? Because Titch’s behaviour is so normal, his difficulties not social or physical but merely educational I wonder why I feel as though this is big news, but I do. While I manage this news I must say that I did love how they reacted to the genetically correct assumption today that they weren’t brothers. They paused a minute and then both threw their heads back and laughed. Although they know their different stories and their origins, they thought he was joking. What a team! I write here about Jiggy. Of my six children he is the one that I have been so totally responsible for and he is the one who is now so entirely under the radar that I feel the need to speak publicly about him, to hold our stories out as proof that we are doing what we can and that we are being careful with him. I don’t want the sort of ‘support’ that leaves us feeling smaller and weaker, less able to raise him, less able to understand him the way we do. However, being off grid is a scary place. It is quite isolated out here. I occasionally consider pointing out to the local authority that they really should be keeping an eye on us but then I picture hordes of grey suits bearing down on our colourful and chaotic little world and shudder. That said, Jiggy isn’t the only one who would benefit from some time in this bubble of ours. Moo has had nearly four years of education and still can’t do simple number bonds to 5. She has been on School Action for some time and the academic gap between her and her peers does nothing but widen. Many children exposed to drugs and alcohol in utero need to go over and over a thing before it sticks and school just don’t have the time. I think I probably spend about thirty hours for each hour that school has to bank simple basic building blocks such as money, time, number bonds and times tables. She loves school though and gets much more socially out of it than Jig ever could, or did. So, with her blessing, I am considering suggesting a flexi school arrangement for her, to scoop her out of the race she is so clearly losing, to move the goal posts and to make a new Moo shaped space for her in this quirky world that is our day. It is IEP week this week, perfect timing. IEPs are all about writing a to do list that doesn’t actually impact anyone nor does it require any actual resources or input from anyone that is out of the ordinary run of things. I am happy to play those silly games when I need to – which is when I am letting my children settle, giving them time, waiting to see what will happen. However, those times end. I don’t expect anyone to know that I have changed my tack, or that I am now going to start requiring actual action rather than virtual action and it may be unfair of me, now, to be demanding that learning deficits be addressed by the application of some sort of actual teaching when I didn’t before. But then life isn’t fair and they have had a good ride thus far. If the SENCO doesn’t have a plan for me by Wednesday 3.30 then Moo will be home with us one day a week on a maths workshop day pending their further communication to me regarding a real individual education plan – with actual teaching. No doubt I am not as good as the teachers, no doubt they could do a much better job, no doubt there have been umpteen training days and policy wallah meetings about how best to teach her but, in the end, no one seems to be actually doing it. Better me than no-one. Flexi schooling has never been a first choice and, if I were a different, braver, calmer woman I would have had her at home full time anyway but I’m not. This may well be a good enough compromise.